At our old place I’d installed a Venstar wireless programmable thermostat, which let us both (a) move the unit around based on where we are, and (b) it has an automatic circulate feature that turns on the fan for 5 minutes at the top of every hour. Just moving the air around a bit is much cheaper than turning on the AC compressor. I looked at the Nest, and while I loved it I wasn’t in love with the price. And Public Service of Oklahoma offers us a Honeywell Lyric for $99…it doesn’t exactly solve the same problem in the same way, but for $150 in savings it’s worth a shot. Removal/Installation: pretty standard. Since this HVAC system is uncomplicated like most, removing the old and installing the new unit wasn’t difficult. The locking pins for inserting the stiff wires into the Lyric really calls for a needle nose plier (in addition to slotted and Phillips drivers). Turn off the AC at the fuse box beforehand, but remember that the Red power lead to the thermostat will still have voltage! Setting up the Lyric: It takes a few minutes to boot up, and then it creates its’ own Wi-Fi network which you join your iPhone to in order to complete the base configuration (naming the thermostat, etc). When completed, you then send your regular Wi-Fi network credentials to the Lyric, which it joins to reach Honeywell, call up weather data, and let the app talk to the Lyric from anywhere. Then you can do all the heavy lifting: set the temperature band for cool (76) and heat (65), what notifications you want, etc. 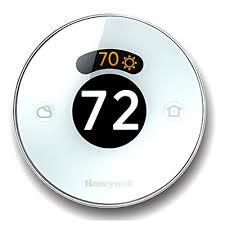 One of the first things you’ll notice is that it shows you both the interior temperature and humidity. Since the Lyric is aware of the outside temp and humidity, it has a Fine Tune setting that adjusts indoor temp and humidity relative to the outside. Humidity is our big enemy here in Oklahoma: interior humidity shows 46%, and outdoor humidity is 71%. Geofencing vs. Learning: The Lyric’s main energy saving feature is Geofencing, where the Lyric app on your iPhone knows when you’re away from home and sets the system to Away, saving energy. When you get within your set distance (2 miles is the default), it will turn the system back on to start cooling. Contrast this with the Nest approach, where it seeks to learn your routine and behaviors via it’s motion sensor. Shorcuts = Programming: this is where you can get creative with things. Like last night, I created a shortcut that dropped the temperature 5 degrees from 11pm–1:30am for sleeping. Then, at 1:30am I told it to circulate (fan only unless temp rise necessitates cooling) until morning. Wish list: I’m sure the software will get smarter via upgrades much like the Nest, and one thing I’d like to see is a temperature log…show me the temps and humidity the house experienced during the day. My office system gives me that. UPDATE, 11/3/2016: Last month Honeywell released a couple of updates to the App, and one of the big fixes is letting you set the Sleep setting band much closer than 5 degrees. This saves more energy and keeps us from freezing overnight. I’ve also switched the Fan Mode to Circulate, which behaves now more like my Venstar and turns on the fan occasionally. I was sure I’d be using this mode; I just didn’t try it during the first month or so for comparison. The Verdict: Pretty Good. My September bill was $171 (it was HOT), and October bill was $126, which is an improvement over the summer numbers of ~$200. We also changed out the AC filter which makes the unit run/cool air more easily, and in early September we added a bit of Freon to the condenser. Typical maintenance is important. Very cool! The geofencing concept is new to me but it makes a great deal of sense. Good post. Thanks, Bill. Since both Karen and I have the app on our phones, we’ve realized we need to set the geofence radius down to 1 mile. The system responds pretty quick, and as she drives around south Tulsa it was coming on too much.